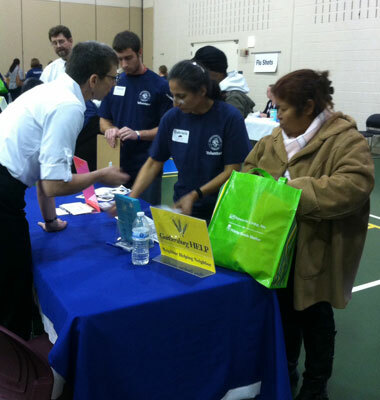 Gaithersburg HELP joined community supporters for Homeless Resource Day on November 7 at the Bohrer Park Activity Center, in Gaithersburg MD. This event was co-sponsored by Montgomery County Executive Isiah Leggett and Sidney A. Katz, Mayor of the City of Gaithersburg. Homeless Resource Day, a one-day one-stop event, offers resources and information to homeless residents. Services include free medical screening, legal services, financial counseling, employment services, tax assistance, substance abuse, mental health counseling and other social services. One participant, who recently moved to Montgomery County from Ohio, was without health coverage, and saw a doctor in the mobile health van. At 4 months pregnant, she also had high blood pressure. The mobile health van had stock of one needed medication but not a second one. The doctor brought this mother-to-be to the Gaithersburg HELP table. We filled out an intake form, called a local pharmacy and HELP approved payment for the second medication on the spot. She was able to get the needed prescription that afternoon and was extremely appreciative. At the event, she was also able to get assistance filling out a Medicaid application, get connected to a prenatal health clinic for ongoing care, and get a flu shot.